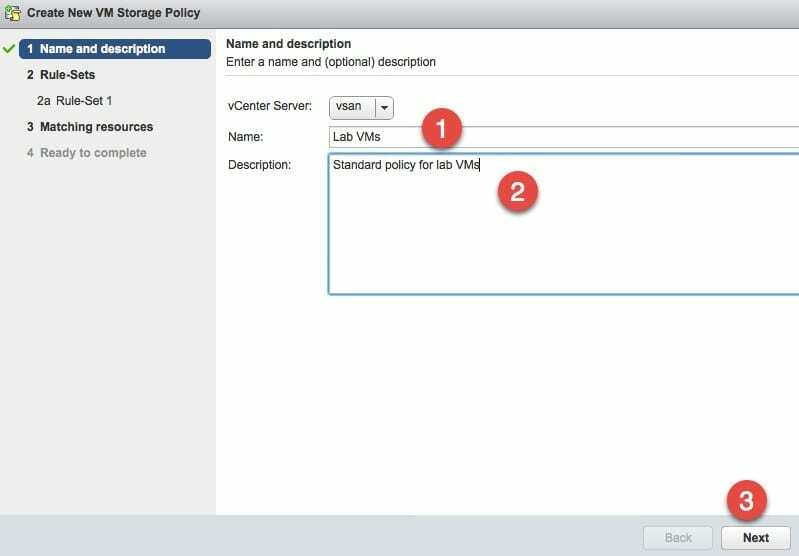 In order to control the behavior of VMware virtual SAN (vSAN) storage, we need to use storage policies. 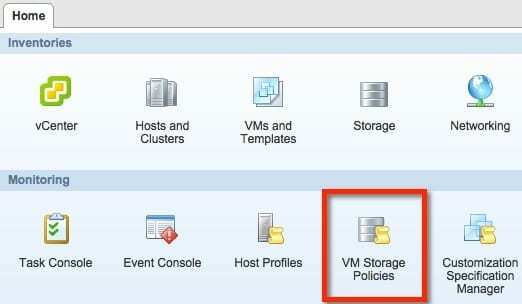 These profiles allow admins to create rules that utilize capabilities advertised by the storage. 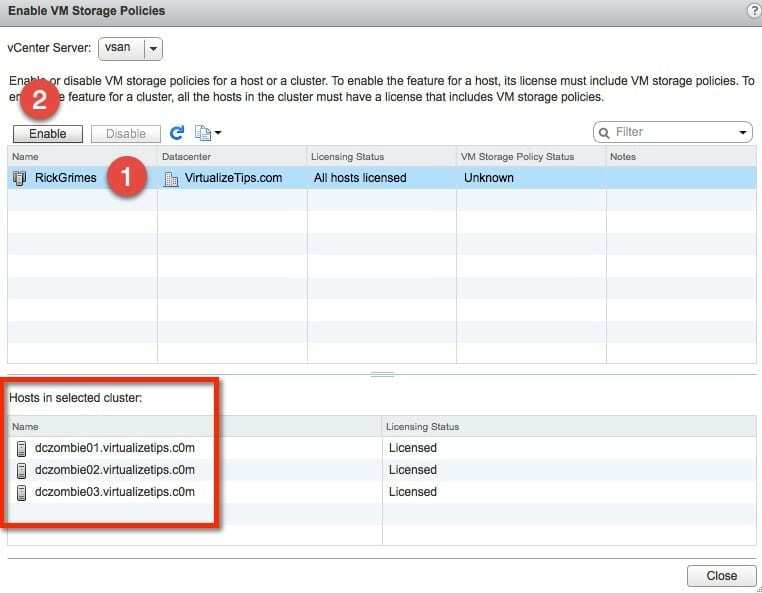 These rules allow for control over performance or protection levels of a virtual machine on a vSAN datastore. This post will walk through the short process of enabling and creating a new storage profile. 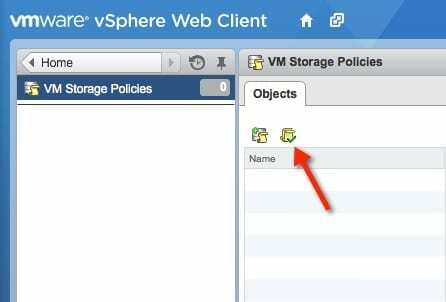 To get started I’ve logged into the vSphere web client and located the icon for VM Storage Policies. Click on the icon, make sure the service is enabled, and then we can start to configure. 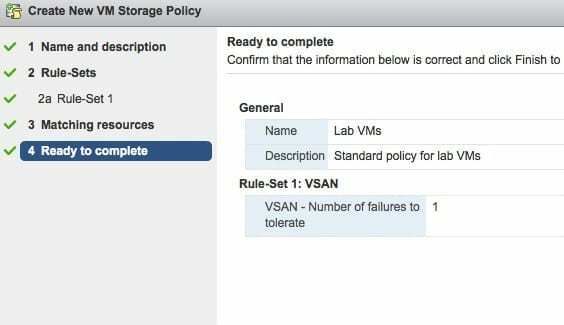 The first step is to enable storage policies on our vSAN cluster. Click the highlighted button as shown in the image below. This will open a window that will tell us the current VM storage policy status. If its anything other than enabled we will need to enable. To do this click on the cluster that we want to turn on and click the Enable button. We are now ready to create our first storage policy. We are back at the previous screen and click the icon show to create the policy. We can now walk through the wizard. First, enter a name for the policy and write a description. The description will help others understand how the policy should be used. We are now ready to create the rule set. 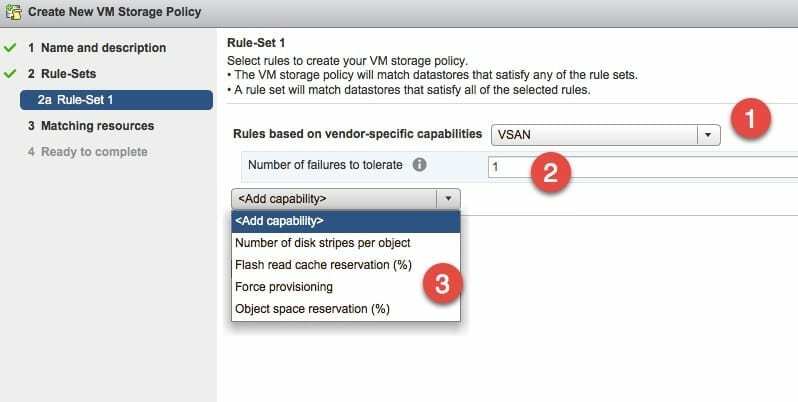 The first step is to pick vSAN from the list of vendor capabilities. If you have other storage that supports VASA there might be more than just the vSAN option. For the first rule, select the Number of failures to tolerate. This can be used to adjust how many copies of an object or a VM that we want to have on the vSAN cluster. You have the option to define multiple capabilities within a single policy. 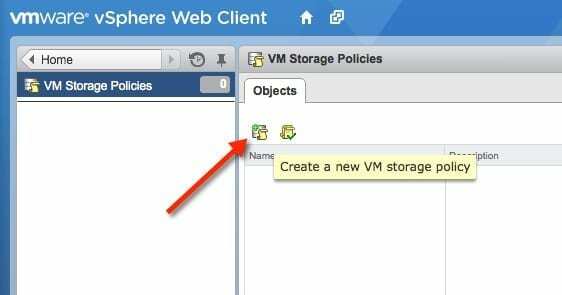 This would be needed if you wanted to enable several storage capabilities on a particular VM, since you cannot apply more than a single storage policy to a VM. Now the rule set that was created must be matched to a resource. In this case, the resource is our vSAN datastore that was already created. The final step of the wizard is the confirmation screen. This shows the details of the policy we created, listing the rules/capabilities that were selected. Creating storage policies is pretty easy. I don’t see many customers creating policies so far, but I do expect this to become more common. As new storage technologies continue to develop and be more software controlled, I think the need for storage policies will continue to grow. Brian is a Senior Technical Architect for a VMware partner and also writes for his own blog at Virtualizetips.com. Brian works with enterprise clients on creating virtual infrastructure, VDI and Cloud related design solutions. He is active in the VMware community and helps lead the Chicago VMUG group, and has been awarded VMware vExpert status for 2013, 2012 & 2011. He also holds the following VMware certifications: VCP3, VCP5, VCP5-Iaas, VCP-Cloud, VCAP5-DCD, VCAP5-DCA, VCA-DT, and VCP5-DT.